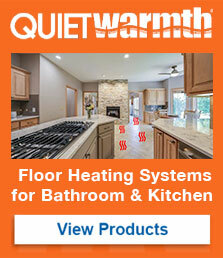 QuietWarmth Peel and Stick Radiant Heat for Tile Floors is an in-floor electric radiant heating system for adding comfort and coziness to rooms with traditional tile, stone or marble flooring. MP Global Products introduces QuietWarmth Peel and Stick Radiant Heat for Tile Floors, an in-floor electric radiant heating system for adding comfort and coziness to rooms with traditional tile, stone or marble flooring. According to the company, QuietWarmth for Tile Floors complements the recently launched and very well received QuietWarmth Radiant Heat Film for Floating Floors. Both use a unique conductive ink technology embedded in a flexible thin film and generate gentle highly efficient supplemental heat from under the finished floor covering. QuietWarmth for Tile Floors’ ultra-thin radiant heat film is integrated in a waterproof anti-fracture membrane which helps isolate cracks up to 3/8-inch wide. The clean, quiet, hypoallergenic and maintenance free lightweight system, sliver thin at just 0.05-inch (about the thickness of three stacked credit cards), provides up to 85% heated surface coverage, without any hot or cold spots. Using only 12 watts per square foot, the system disperses gradual evenly consistent supplemental warmth from low wattage resistance heating of the radiant heat film, said the company. Featuring an ultra-thin heating film, QuietWarmth Peel and Stick Radiant Heat for Tile Floors installs quickly in one day without any mess, mortar or glue. Simply roll out each peel-and-stick mat. Each mat has wires pre-attached at one end. Direct all lead wires toward one central junction box with the final connections by a licensed electrician to the electronic programmable thermostat. One thermostat will handle 150 square feet of heat. QuietWarmth Peel and Stick Radiant Heat for Tile Floors is available in four rollout pad sizes (3’x5′, 3’x10′, 1.5’x5′ and 1.5’x10′) that will accommodate most any layout, according to the company.